Today showed me the best and worst US 30 had to offer. The road through the Appalachians was a five-star driving experience. East of the Susquehanna, through York and Lancaster, it was a colorless quasi-Interstate which didn't just scrupulously avoid all the numerous highlights of this area, but had actively contributed to the cheapening and degradation of the landscape. Even a short jaunt on the Appalachian section of US 30 makes clear why the Pennsylvania Turnpike was such a success. The Turnpike and US 30 meet at Irwin, on the western end, and Breezewood, on the eastern; in between, they take very different routes through the mountains. The Turnpike carries four lanes of traffic along steady grades and through tunnels, while US 30 guides two lanes up and down every hill. Four-mile stretches of 10-degree hill are not uncommon; on many of these, trucks are limited to 20 mph and provided with numerous runaway truck ramps. Not surprisingly, I didn't encounter any large trucks on this road. The most notable landmark I passed was the old S.S. Noah's Ark, perched high on the slopes of Mt. Ararat as it has been for at least fifty years. When US 30/the Lincoln Highway was the main route through the Appalachians, this was among the most famous tourist attractions in the country. Built originally as "Noah's Ark" and converted into a replica steamship, this building offered tourists a panoramic view of three states and 17 counties; it also served as a restaurant and hotel. Now it's closed and abandoned, the stairs to the viewing perch fenced off. The building still seems in good repair, though, as if a single summer would be enough to restore it to its former glory. But why bother, since no one's left to enjoy the view? The next stop was Old Bedford Village, several miles north of Bedford, PA. Opened in 1976, the Village contains about forty structures from the 1780s-1850s, carted from elsewhere in the area and restored as a 1790s frontier town, with employees performing indigenous crafts: a sort of frontier Colonial Williamsburg. The certificates of occupancy identify the building owners as the "Bedford Redevelopment Authority," which suggests that the natives of this region which seems to have been bypassed by the modern world viewed the Village as their best chance to attract outside dollars. The Village also touts its participation in a program to employ senior citizens, and that it does -- more than half the employees looked to be eligible Social Security. While socially commendable, this policy did detract from the Village's realism; a single Appalachian winter of the 1790s would have killed most of them. Of course a town like Bedford would have a hard time enticing any of its young people to stay, so this employment practice may be making the best of a bad situation. The Village was entertaining, in its modest way, but I came away feeling like the planners had cut a few corners -- spending 10-15% more on the restoration and furnishings would have added considerably to the experience..
After passing through Breezewood, "Town of Motels," and over a few more mountains, the road entered central Pennsylvania farm country. East of Chambersburg, Mr. Ed's Elephant Museum distracted me for a few minutes: a museum and gift shop dedicated to the elephant in all its forms, and a 9-1/2' talking elephant, with moving face, in front to entertain the children with its two- or three-minute recorded message. Then came Gettysburg, which until 1863 was a sleepy crossroads trading and college town. One three-day battle and one two-minute speech later, its name is known throughout the world. The profusion of Lincoln- and Civil War-themed attractions in the area is more tasteful in reality than it appears in a guidebook, and the more than one thousand pieces of military statuary ringing the city add a nice touch. From east of Gettysburg through Lancaster, though, nothing nice can be said about US 30. East of the Susquehanna, a four-lane divided highway opened in 1972 to replace the original road, which was renumbered SR 462 and is still known as the Lincoln Highway or Lincolnway almost everywhere. If a traveler on the new road happens to look, a few miles east of York, to the top of a nearby hill, he or she will spy a worthy excuse to return briefly to the old road. 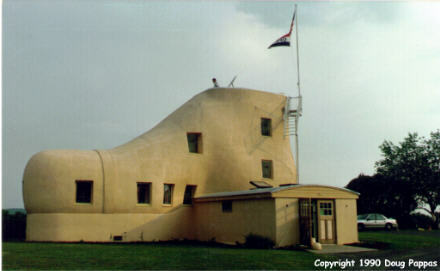 In 1948, an eccentric Pennsylvania shoe merchant named Haines erected a five-story building in the shape of a shoe, publicizing it via his stores and inviting newlyweds and the indigent to stay there. The shoe house, located logically enough on Shoe House Road, fell into disrepair after his death; when I passed it several years ago, the paint was flaking and the property looked abandoned. Since then, however, Haines' granddaughter and her husband have restored the shoe to its former glory and it's been opened for tours. Nice to see one of these buildings stage a comeback. In and around Lancaster, though, nothing good can be said about US 30. 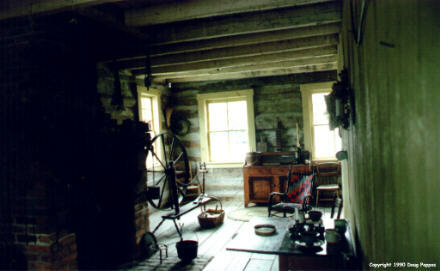 It bypasses the city for several miles without even offering Pennsylvania Dutch land as scenery. Then when the old and new roads reunite, the result is a solid, four-mile strip of chain stores, malls, Pennsylvania Dutch-themed attractions, and the latest contribution to urban blight -- factory outlets. I've got nothing against factory outlets per se. It's just that, like everything else in the world, it belongs in the proper place. And the proper place for outlet stores -- let along the outlet malls which litter the landscape of south-central Pennsylvania -- is at the edge of an urban area. Or on a toxic waste dump. But NOT as a way to replace beautiful, tranquil rolling hills with acres of concrete and garish colored signs with all the charm of a crematorium. Reading, 35 miles north of Lancaster, advertises itself as outlet headquarters, so of course Lancaster is determined to catch up. Ugh. As I stopped for the night, I hoped that Dutch Wonderland wouldn't look so bad in a different light.